My name is Matt Miklic, and I lead a team of three designers dedicated to our native apps. We focus our time on the design of WordPress for Android and iOS. Over the last few months, the developers and designers who work on our apps have been improving our support for the accessibility features available on mobile devices. This includes ensuring our apps properly support features like VoiceOver on iOS, and TalkBack on Android, which make the apps accessible to blind users. One new feature I’d like to highlight is support for dynamic type sizes. This lets users choose larger (or smaller) text, to find the size that’s most comfortable for them to read. 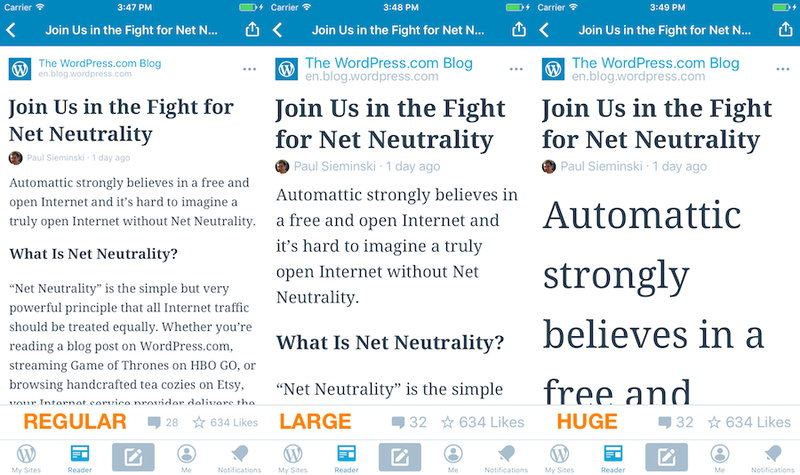 We recently made a change to the text used for blog posts and pages on iOS to make it even more readable. Now, no matter what text size the user prefers — even the largest sizes, which are huge — WordPress responds as the user should expect. This makes the app accessible to users with low vision, in a way that wasn’t possible before. If you use an Android device, you can customize your device’s font size, too. We’re continuing to perfect this feature, so if you notice parts of the apps where it doesn’t work quite right yet, drop us a line, and stay tuned for future improvements.